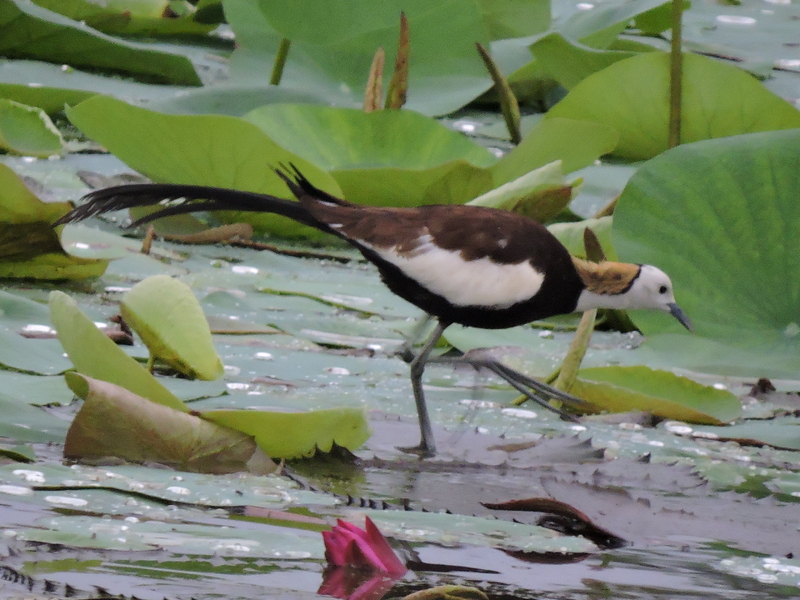 A few months ago, I spotted the Pheasant-Tailed Jacana for the first time. It was the best of times. The most bacchanalian of times too. I felt as though my hair was on fire. Not a wild one that leaves me with first-degree burns. Just a warm flame that makes me feel swaddled. I was taking a stroll near a lotus pond in Chinna Avoor, a tiny village tucked away in the armpits of the town of Thiruvallur. It was one of those rare instances when I was looking for love in the right places. And there she was – a damsel cavorting through water lilies. I wasn’t prepared for to see her that day. That gorgeously-curvy tail of hers, like an unexpected twist in a daydream, drifting away from her wet mud-brown belly. The giant golden cappuccino stain on the side of her neck separated by a black stripe from her buttery-white face. Those daringly large and prehistoric toes. I was overwhelmed by how pretty she looked. And as usual, I panicked a little and dropped the camera. Thankfully, I didn’t frighten her away. I wasn’t happy with a single photograph I had taken of her, but she stayed around long enough to fill my cheeks with the sun. There were other people by the lotus pond. The local butchers, fishmongers and, youngsters with bowel movements and boundary issues. Yet nobody else seemed to notice her. Most of them were looking at me, wondering what on earth had me grinning so wide. And if I had a reasonable excuse for the sideburns. Maybe they were used to being in the presence of these wonderful birds, given the village’s proximity to the Annamalacheri backwaters. Not me. 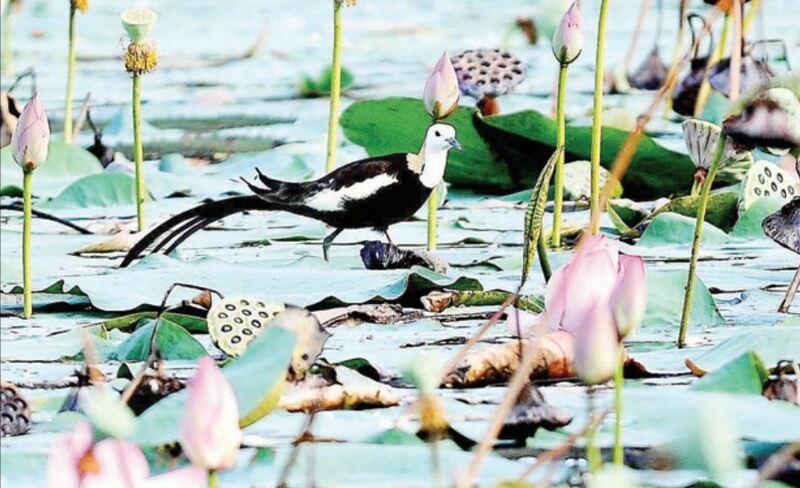 I can’t imagine seeing a Pheasant-Tailed Jacana and ever remaining calm. with cappuccino stains on her neck. with salty lullabies on her breath. A truly beautiful bird and well captured, thanks for sharing. I do wish I shot better photographs of her, but yes she is truly gorgeous! Thank you. Thanks doc for the lovely dollop of encouragement. I love your description of her as a Kacheepuram bride! I do see similarities! And she looks a tad prettier than any bride I have seen (smile). Although I can’t see your beautiful photos, I can imagine this wonder o fNature from your savory words. What’s even more fun is imagining your surprised delight in discovering you are in her presence. Aww Tio, you humble me with your kindness, thank you so much brother, I am glad I can be a small window for you. Your description of the excitement from seeing a bird for the first time was right on. Thanks. Thank you so much stephen! Brilliant! How are you so well-versed with the identification? Aww thank you Nandini! I am actually not well versed as compared to many other birders. Some of them are just amazing -the way they identify bird calls and flight patterns. I rely on Inskipp and Grimmett’s Birds of the Indian Subcontinent field guide. You can check it out just for the spectacular artwork.